We have it all in one place. We offer a complete line of packaging and janitorial supplies, and we deliver the expert advice that ensures you get the best performance and greatest value from those supplies. 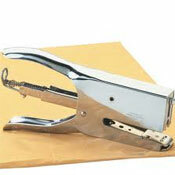 We offer a full line of various sizes of staples and types of staplers for every commercial and industrial application. Staples and staplers can be used to fasten the flaps of filled boxes of all sizes – from very small to large palletainers. 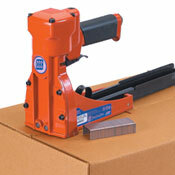 The staplers drive wide-crown staples through the corrugated flaps with a clinching action. The combination of staplers and staples is used in virtually every industry in situations where companies require the speed of this efficient process. Depth adjustments on staplers are important, because the adjustments allow the use of one size staple to seal a range of carton thicknesses – from ect32 to 275# double-wall corrugated with double-layer fastening. Stapling empty cartons requires a backing support, which allows the jaws of the stapler to penetrate the secondary flaps of the carton. If a backing is not used, the flaps will move away from the stapler’s jaws, and the staple will not hold the material or the staple’s grip will be incomplete and loose. Staples come in several types. “A” crown staples are 1-3/8 inches wide, and “C” crown staples are 1-1/4 inches wide. Standard lengths are 5/8, 3/4 and 7/8 inches. Staples are made from copper-plated steel, for protection against rusting. Staplers are hand-operated or pneumatic, which offer faster and easier use. If you have any questions about our products use, please contact us at info@lafpak.com or by phone at (610) 356-8500.